Indrawanto is exploring palm tree nectar into various shapes and types of sugar. Because it is made from sugar palm that grows naturally in the mountains, no chemical fertilizers and pesticides, plus processed following the organic principles, he was sure it would be accepted as organic sugar. As it has referred as a waving palm country, actually Indonesia could be also called a palm lined country. Because of so many aren palm tree thrives in a wide range of its mountains, mostly a non-crop cultivation or it has just grown without any human intervention. It is also one of the starting points so why Indrawanto and his wife, Evi Indrawanto, when three years ago started Diva Maju Bersama producing granulated arenga palm sugar or gula semut aren in Bahasa Indonesia. According to them the palm raw materials are easily obtainable around the country. He founded his company with an initial investment of 200 million rupiah. Indrawanto cooperation with aren farmers of West Java, which supply 20-30 tons of sugar each month. 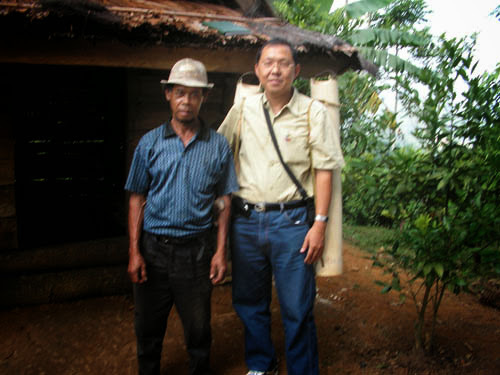 It is a small scale industri, moves from the home area in Serpong , Tangerang where he lived in, he hired four employees. He diversity the products ranging from mold, granulated until liquid palm sugar. Now as you can read from one of Arenga’s blog, they can produce 30 tons of sugar monthly which half of it has absorbed by various food industries. The clientele are 6 factories that spread in Tangerang and Jakarta. While for retails he set prices of Rp 7,500-Rp 9,000 per kg for mold and the powder ones Rp8.500-RP. 10. 000 per kg. (Note : thi is the price of 2008). There is another reason why Indrawanto so excited to pursue this effort. There is a growing demand from people who want to live a healthy life by consuming only products made from organic or natural raw. Of course Arenga palm sugar has a tendency to answer it. Because the sweetness levels 80% lower than cane sugar. As it has already mentioned above that the habitats of palm tree in the mountains is growing organically, how unspoiled nature they are, that is why it doesn’t an overstatement when he called his product as an organic sugar. In an exploring of the aren palm, Indrawanto is trying produce various forms of sugar. He, for example, provide palm sugar for food industries in bulk packaging of 10 kg each. Retail packaging in aluminum foil pouch 225 gram. Arenga also available in liquid packed in 650 ml glass bottles. And, because this product still needs to be introduced intensively- at least when we compared it with white sugar -Indrawanto diligently follow of various food exhibition. Including the recently participated in the Halal World Expo 2007 held in Abu Dhabi National Exhibition Centre – United Arab Emirates. To put lodong (bamboo tube to accommodate nectar ) to the top of the tree, sometimes more 20 meters high, the tappers need a hollowed bamboo ladder. “They have to climb this ladder 2 X a day, morning and afternoon because sap with natural preservatives can only survive for 12 hours. If it passing of time, they will turns into vinegar and have can no longer be processed into granulated palm sugar,” she wrote again. After that it took much longer for evaporating the water content which is an average of four hours per day. And the so complicated process of presenting the material that physically exhausting, it only half the story. Therefore that is why Indrawanto should work closely with the farmers. He could not only thinking about how to package and market the product wich is loaded with the local wisdom. On the other side the business potential is quite large particularly when we considering this healthy sugar has been increasingly recognized by the market. As you knew they have been using in various restaurants, cafes, hotels and leading food factories. But on the other hand he still had to fight within the dosmetic issues such as how to keep the products can be readily accepted by the market standards. Niar, we have same problems. Because we got the languages by learning, If we do not use it for some time they will jus go away.So I ventur writting in english. It still bad though and sometimes asking help on google translate. So why not, this is all I know. Wow .. another blog in English, kak Evi. It's awesome. I agree with you, Evi, the English language, once we ignore to practise it then it will vanish from our brain. So, again, I agree with, we have to encourage ourself to practise it, eventhough the readers, perhaps, will find some typographical or gramatical errors, never mind,go forward — as long as they will get the conclusion of the content. Are u with me, guys. Big hug for u, Evi. I hope one day I will order your Arenga.